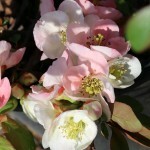 An upright growing shrub with pink, white, red, and combination flowers on the same branch. 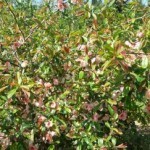 The flowers are followed by fruit, safe to eat, but bitter. It blooms in the early spring. Prefers full sun to part shade, slightly acid, well-drained soil. It will tolerate dry sites as well. Great for a border, a barrier plant, or for mass planting.